If you're into boating long enough, the time will come when you get caught out in a vicious thunder storm. When that time comes, you either know how to handle the situation or you don't. The big problem is that for the most part, we don't know where that will be when it happens, how long it lasts and how intense the storm is. We all pretty much agree that the weather experts are not very good at predicting these things. That is not their fault, because thunderstorms can develop very quickly. If it happens to develop very close to where you are, then there's not much chance for an advance warning. The good news is that very severe storms normally require certain favorable conditions that ARE somewhat more predictable. Such as frontal boundaries which create an unstable atmosphere. Just because the local TV weather bimbo isn't very good at predicting precisely what will happen (after all, she's probably just reading the teleprompter and doesn't know squat about the weather), we shouldn't ignore the weather information that is available to us. That is why sailors (who go around in boats that are very slow and can't escape storms) learn to become weather experts themselves. If you're not willing to take the time to learn to read weather maps, then the least you should do is to learn to read the sky. Being on the water means that you usually have a far horizon available, so that you should be able to see a storm coming and have opportunity to flee from it. If you do get caught, here are some tips to help you stay out of trouble. One cannot always tell how severe a thunderstorm is by looking at it. Sometimes we see ominous squall lines that look like the apocalypse coming. And then almost nothing happens. At other times it may not look so bad and turn out to be the end of the world in disguise. Or so it seems. One of the problems we have with thunderstorms is that they do not conform to any rules of behavior. Though they may appear to be moving in a certain direction, that is only from your perspective. From a larger perspective, they can be moving in more than one direction at once, as they always do along a frontal boundary. You can observe this phenomenon on weather radar loops. Individual cells moving in one direction, but the whole system in another. Understanding this will give you a better chance of predicting movement. When storms pop up along frontal boundaries, the overall front is moving in one direction, while the storm is moving in another. The front may be moving east to west, but the storm cells are moving north to south along the front. My point here is that the apparent direction of movement may not be the true direction. 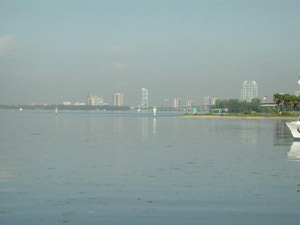 The Miami skyline on a beautiful morning. Didn't last long though, for within a couple of hours it looked like this. 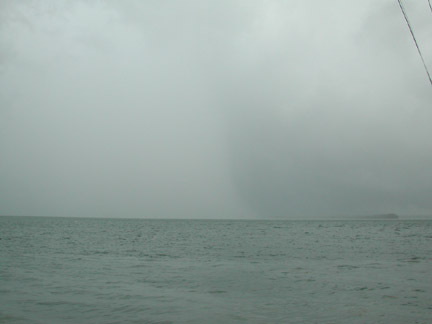 This squall line is moving on shore, but notice that the sky ahead of it is also dark. On this day, the storms were unceasing. We especially want to avoid storms associated with weather fronts because both the strength and duration of thunderstorms is likely to be the strongest and of longest duration. Moral: Don't plan to go out for the day without checking on a reliable weather map or report. That doesn't mean those childish graphics that pass for weather maps in newspapers. The best and easiest available source is the Weather Channel or any one of the official NWS or NOAA web sites. When you do get caught, your most immediate problems are loss of visibility and high winds. And depending on your location, rapidly building seas. How you react and what you should do depends greatly on the size of your boat and the type of body of water you are on. No one can tell you precisely what the correct response is because every situation is different. Obviously, if you're in a very small boat you are in big trouble if high seas becomes a threat along with the loss of visibility. The most important thing is to avoid panic and rash reactions. Break out the life jackets and tell passengers to put them on "just to be safe." It is important to keep the inexperienced people calm, lest you end up with more problems. Convergence: Soon storms are unpredictably popping up all over. Winds here were estimated at 45-50 knots. Seas from zero to 5 foot in fifteen minutes. Close to a bunch of islands is not a good place for a big boat to be, so we get away, pronto. Next, consider your position. There are several things you want to avoid: Dangerous shorelines, inlets and potential collisions with other boats. How many other boats were around you when you lost visibility? If there were quite a few, and visibility is down to just a few yards, reduce your speed to the minimum needed to control the boat. Begin sounding your horn at regular intervals, say 15 seconds, until visibility clears. Don't go running blindly about at high speed as many boaters do. Collisions are a very real risk, so you should prepare for one. If it looks like the storm may only be of short duration and wind and waves do become threatening, along with threats of collision from loss of visibility, but you are close to a shoreline and are in danger of going ashore, head your boat into the wind and maintain a slow headway. This is something that often happens in Florida with its frequent storms. It turns into a kamikaze mission to be running blind, so the thing to do is stop and hold position and hope that all other boats do the same thing. >>This is what it ultimately becomes with rainfall rates that blot out all visibility. Those are same islands in background as photo left. Same day on the bay as top photos, different storm cell. In a big, fast Hatteras, we can afford to fool around, but in a twenty footer, you'd be in trouble. Tossing out an anchor probably isn't a good idea unless you are in a very narrow body of water, have completely lost visibility, and going ashore is an immediate threat. If you have plenty of maneuver room, it's best to remain in control of the boat and stand off. In most thunderstorms, the wind direction will soon change. 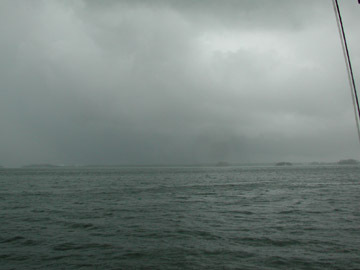 Thunderstorm winds are caused by down drafts created by the falling rain. The rain pulls down air with it. The winds generally blow outward from the center of the rainfall area. As the storm approaches, winds are blasting straight at you. As the rain cell passes over you, the winds will slack off, then reverse directions (just like a hurricane) and blow from the opposite direction, usually with less intensity. Understanding this pattern can give you a good idea of how long you'll be exposed to those conditions. Being able to judge the forward speed and path of a thunderstorm is a definite help toward making right decisions. 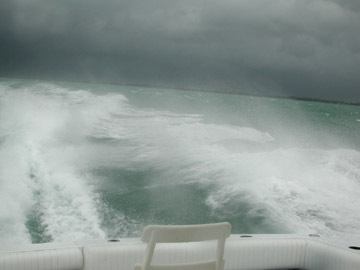 ALL boaters should learn to pay attention to weather and try to learn as much as one can about its behavior. 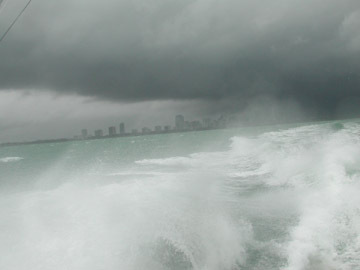 Serious boaters know all about storm behavior, can accurately predict severity and conditions, and take appropriate actions before it's too late. That doesn't necessarily mean avoidance, but it does mean the ability to place themselves and their boats in less threatening positions before the storm strikes. A typical example of what I mean is the ability to predict timing so that one knows not to rush toward a dangerous inlet just as a storm hits and visibility is lost. How do you learn things like this? Well, by taking the time to observe storms when they are about. When there is a storm on the horizon, is it going to hit you or not? Does it look serious enough that you should NOT take the chance? Size, direction of movement and speed help answer this question. So does knowing whether there is a front approaching, or whether the atmosphere is unstable. In the later cases, what appears as one storm can soon become two or three, and rapidly grow in size and engulf you, not by storm movement, but by expanding cell development. The experienced boater keeps one eye on the sky at all times and learns to spot this development before it's too late. There was one occasion when I got trapped far out in the Gulf Stream. Thunderstorms built in the west over the Everglades as they always do in the summer, and then proceed to move eastward. I was not paying attention to the fact that storms were also starting to build to the south. Soon we had storms moving from the west and south, and of course, they converged in the southwest, making for some of the worst thunderstorms I have ever witnessed, threatening to even a fifty foot sport fisherman. Except for night-time storms, this was the only time I had ever been frightened by thunderstorms. They were severe and lasted most of the day and into early evening. 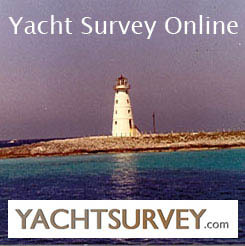 The results were that we lost a Bimini top, an outrigger and two windows. The interior of the boat was a shambles: the sofa broke loose and smashed part of the salon interior; the reefer door tore off and dumped its contents. A battery box broke loose and shifted into an engine alternator, knocking out the DC system on one side. Why did all this happen? I'll tell you this: we ignored warnings of unstable weather (a tropical low was developing over us) and we weren't paying attention to what was happening weather-wise around us. We should have seen it coming (developing) and cut our fishing short. As it was, we stayed 15 miles offshore and got our butts kicked but good, learning a valuable lesson in the process: Mother Nature holds all the cards. Unfortunately, there are situations where you can find yourself smack along the path of a line of storms, in which case you'll be hit by one cell after another. This is the worst possible scenario, and one that usually could have been avoided had you done your job as skipper and checked the weather before you headed out. Storms of this type are in association with fronts and atmospheric instability, and such information is available in advance. Getting caught in this stuff is a baptism by fire. And wind and rain and waves, as I described above. Here the storms do not let up, but hit you one after the other, and can go on for hours, even days. This is serious, life-threatening stuff. When caught in this kind of weather, the best strategy that I know of is to bide your time and wait for a break between storm cells when you can make a mad dash for port, if you are close enough. The one thing you do not want to do is to try to negotiate an inlet on a lee shore with no visibility. (a lee shore is one toward which the wind is blowing). If you're far offshore, you may want to try work your way closer to shore (visibility permitting) and then stand off at a safe distance. If you have shelter available (but are far from port), such as islands and peninsulas. Whether sheltering is a good idea depends much on depth of water and shorelines. In smaller boats, if there are sandy shores, putting up on one may be a good idea. Just bear in mind that with thunderstorms, wind directions will probably change, so that seeking shelter in the lee of a landmass could mean getting caught on an exposed shore. If you perceive the situation as life threatening, it's better to sacrifice the boat and save yourself and family or friends. Rocky shores are very dangerous to both boats and people. You want to stay clear of them at all costs. Use an anchor if necessary. This brings up the issue of preparedness. You and your boat should be prepared at ALL times. Trouble comes in its own time, not yours. Anchors and rodes should be kept in a state of readiness, along with PFD's and all other safety equipment. At sea, Murphy's law can reign supreme. Thunderstorms are called that because they come with lightning which generates thunder. Lightning deaths and injuries to boaters are on the rise, mainly because there are more boaters that make good targets. Indeed, out on the water you are a good target. In larger boats where you have any kind of structure around you, be it a cabin or just a Bimini top, you have a fair degree of safety. Fortunately, injuries to people IN boats are very few as you have a cone of protection around you. People in open boats are most at risk. The potential for injury increases if you have wet, bare feet. So, wearing rubbery tennis shoes is one help. We hear on TV not to touch metals. That's good advice in a house, but impractical and not necessarily true in a boat. If you have hydraulic steering in your boat, and most boats do these days, you needn't fear holding the metal steering wheel. There is an exception however, and that is if your boat has copper hydraulic lines. In that case, holding the wheel puts your body directly in a ground path. Mostly, only larger and older, and especially Oriental built boats will have copper lines, so it's best to check on the material. Things to avoid holding onto are Bimini top frames, ladders, towers and large railings. Isolated pieces of metal such as small grab rails and the like are not a threat. Particularly keep your distance from radio antennas which are real lightning rods. Lower them as a storm approaches. Keep passengers off the bridge and into the cabin. By all means, keep your hands off the radio mike; holding it is like strapping a lightning rod to your body. In an open boat one is very vulnerable and there is not much you can do to avoid being a target except to avoid standing up. Negotiating Inlets, Tide Rips, Sea State, Currents, Bottom Topography, Recommendations for novices. Last reviewed June 15, 2014.